Portland, ME January 22, 2019 – Chalkline has released a major update to VisiSpecs, The Visual Specification System. New publication, doc formatting, and more BIM integration and collaboration tools lead the new functionality list. Chalkline is working closely with VisiSpecs users to improve efficiencies while adding new value add features. Customers requesting product improvements or reporting issues are seeing a rapid turnaround with Chalkline’s rolling release schedule. 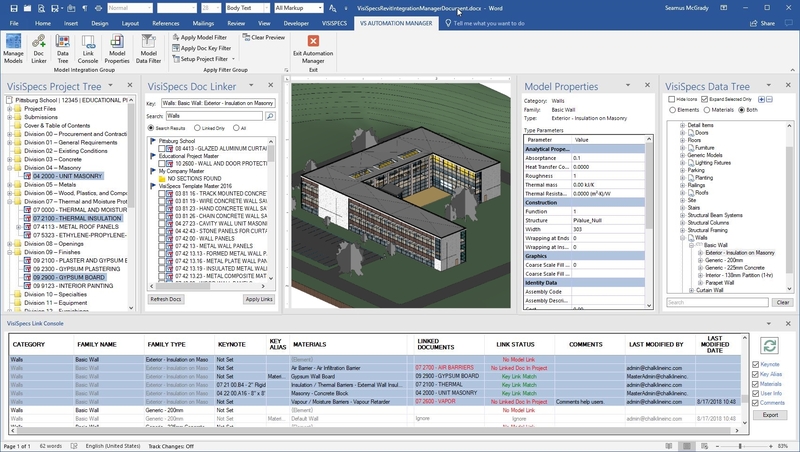 VisiSpecs enables non-Revit users to integrate, collaborate, and verify the model and spec coordination in the familiar Microsoft Word application. 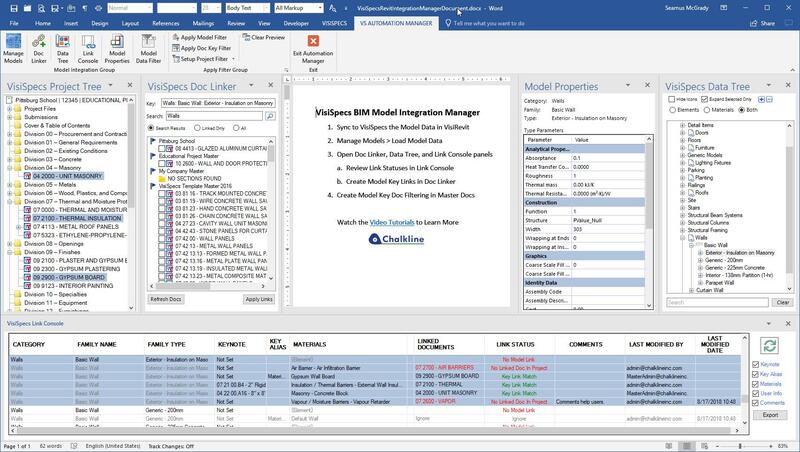 Chalkline has increased its market leading BIM integration functionality in VisiSpecs v19 enabling Microsoft Word users to access Autodesk® Revit® BIM model data for integration, collaboration, and verification purposes. VisiRevit includes a VisiSpecs Cloud Server sync of the model data including elements, materials, sheets, views, and type properties. VisiWord users can then view and markup the sheets and views collaborating with the rest of the team and easily see a list of what has been added, removed, or changed in the BIM model since the last sync. 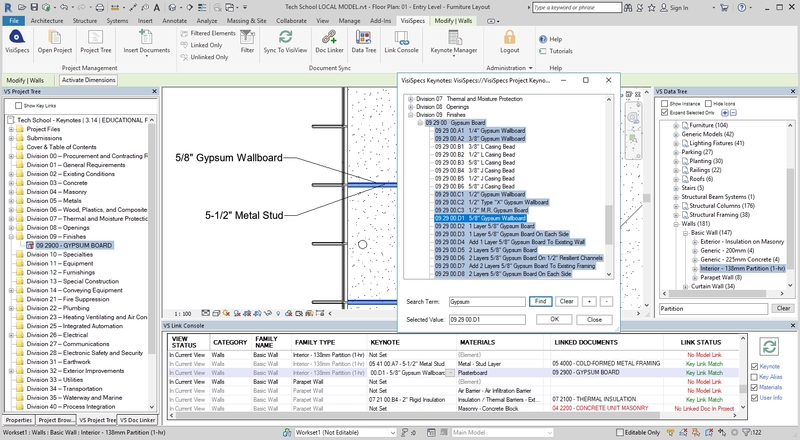 Non-Revit users can link the model elements and materials to the required specs directly in VisiWord, automatically insert the required specs, and verify the coordination of the production set of drawings and specs prior to submission reducing RFIs, addendums, and change orders. Publication of the project manual includes new functionality with v19 such as new Table of Contents (TOC) templates and processing, automatic application of Page Layouts to all project docs, and easier management of PDF files imported into the project. The new TOC templates are based on customer requests including issued and revised dates, project and document merge fields, page counts for all project files, and more control over the style format of the TOC doc. The new TOC integration with Microsoft Word enables advanced style and formatting control in a familiar user application reducing the learning curve. Users with large deployments across their enterprise will also see the requested project search capability and administrative control over external users and shared projects. All users will appreciate a new local user settings storage container maintaining preferences and settings after a Windows, Word, or VisiWord software update. VisiSpecs V19.0 also includes more help messages built into the applications reducing new user learning curve, better local file management, and improvements on the new user experience. Customer input and priority assignment continue to be critical to Chalkline’s product development process. Visit www.chalklineinc.com or email [email protected] to learn more about the VisiSpecs Solutions, request a free trial, register for live webinars, see customer testimonials, and download product information. Chalkline is the developer of VisiSpecsTM, the next generation suite of applications to visually document, coordinate, and verify the BIM models and project specifications. The technology visionary award winning VisiSpecs is a hybrid cloud solution where it’s desktop and mobile applications store and access the model and specification data on the Company's cloud servers for easy access and collaboration among distributed team members. VisiSpecs is built on the familiar applications already in use resulting in minimal training and setup time. Users can easily integrate their own masters and project documents with the project models to accomplish true BIM integration without learning to use complicated model applications and without a lengthy integration process. And for those that do use the model applications, VisiSpecs provides direct, integrated access to the project specifications and documentation. Autodesk, the Autodesk logo and Revit are registered trademarks or trademarks of Autodesk, Inc., and/or its subsidiaries and/or affiliates in the USA and/or other countries. All other brand names, product names, or trademarks belong to their respective holders. For more information, visit www.chalklineinc.com. Portland, ME September 18, 2018 – Stellar, a fully integrated firm focused on design, engineering, construction and mechanical services worldwide, is improving their design process leveraging VisiSpecs, The Visual Specification System. Stellar evaluated VisiSpecs to improve the efficiency of their spec writing process as well as improve the design processes integrating their BIM models to the required specifications. It was quickly determined that VisiSpecs was an improvement to their current processes and could be implemented rapidly as VisiSpecs is built on the familiar Microsoft Word and Autodesk Revit applications already in use at Stellar. The Free Trial enabled Stellar to import their master documents, use the editing and publishing functionality, and test the ease of integration with their existing BIM models. Stellar used their existing master specifications in the trial which included their lessons learned and design preferences. Using VisiWord, Stellar quickly learned that the editing features, customizable project tree, and publishing features worked seamlessly with their existing specifications. Stellar needed an easy to use and deploy application as many users across the firm are involved in the design specifications. The VisiSpecs Cloud Server and familiar Microsoft Word platform satisfied these requirements. Visit www.chalklineinc.com or email [email protected] to request the free trial, register for live webinars, see customer testimonials, and download product information. Portland, ME August 28, 2018 – Architectural Nexus, a full service architectural firm, has selected VisiSpecs, The Visual Specification System, as their specification solution and for its multiple studios and regional offices. Architectural Nexus is a multi-disciplinary, people-driven design firm practicing throughout the western United States. By focusing on people rather than buildings, Arch Nexus designs projects and creates places that not only work well, but also help people be healthy, happy, and productive. Through purposeful design, people are inspired to achieve greatness and be more active stewards of the built and natural environments. The VisiSpecs Free 30-Day Trial allows ample time for clients to import their specification documents, learn to use the functionality and process, and even integrated with their BIM models. As VisiWord is a Microsoft Word Add-In, users are on a familiar application and simply learn to use the project management, doc editing, reporting and publishing features. VisiSpecs doesn’t require customers to change their BIM model or processes so linking the required specs to the model elements and materials is immediate. Customers can quickly understand the benefits and time saving features using their documents and models making their decision to deploy an easy one. Those interested in learning more should visit www.chalklineinc.com or email [email protected] to request the free trial, register for live webinars, see customer testimonials, and download product information. Portland, ME August 21, 2018 – Chalkline has released new BIM and Spec integration functionality directly into Microsoft Word enabling more automation and time savings. Non-BIM users can integration, automate, and coordinate specs with the BIM models directly in Microsoft Word. Chalkline released the first BIM integrated specification solution that runs directly in Autodesk® Revit® 18 months ago. It has now brought that integration and coordination directly into Microsoft Word for those users without access to Autodesk Revit. Specifiers and designers can now create the integration between the model elements and materials and the required specifications directly in Word. Coordination issues are flagged for users reducing the RFIs and Addendums due to errors and omissions. Details on what has been added, removed, and changed in the model since the last model sync is also available helping users easily understand possible conflicts and updates required. Project Key Filters can now automatically include or strikeout project specific language in all the project language such as whether this is a LEED project or what building codes will be used. Set the project criteria once and have all project documents updated automatically ensuring a higher level of consistency while saving time editing specifications. Document Key Filters enable users to create a document specific checklist with links to all the related paragraph and bracket items required. When a product is selected all the required language will be included and for products not selected those related items will be removed. VisiSpecs Filters all include simple built-in tools for creating and previewing so users can easily manage how the document will be modified based on the applied filters. VisiSpecs V18.1 also includes the automatic inclusion of PDF Project Manual bookmarks making reading and navigating the manual much easier. Additional project management, publishing, and Word document management features requested by customers have also been added to the release. Customer input and priority assignment continue to be critical to Chalkline’s product development process. Visit www.chalklineinc.com or email [email protected] to learn more about the VisiSpecs Solutions and to request a free trial, register for live webinars, see customer testimonials, and download product information. Portland, ME April 25, 2018 –HDR, a global firm that provides architecture, engineering, environmental and construction services, has selected Chalkline’s VisiSpecs, The Visual Specification System, for their design specification solution. HDR evaluated available commercial specification tools as a replacement for its internally developed specification production tools. “VisiSpecs was selected based on its quick learning curve, ease of cloud based deployment across the many users within the firm, and ability to integrate with BIM applications,” according to Eric Michnovez, Specification Manager at HDR. A requirement for the new spec tools was easy deployment with minimal technical support or IT resources. VisiSpecs has delivered with simple-to-navigate user rights managed by the central HDR Specification Management Team. “The VisiSpecs Cloud Server allowed users in any location to easily connect to the HDR VisiSpecs Corporate Account with performance that exceeded expectations,” Michnovez said. Ease of use was critical for HDR as the transition needed to be seamless with a very fast learning curve. Since VisiSpecs uses Microsoft Word for the editing, publishing, and project management application, HDR provided a short “Quick Start” guide for the installation and getting started tips. This enabled project team members to continue focusing on their project responsibilities instead of being pulled into training courses. “Chalkline is happy to have such a well-respected firm evaluate and choose VisiSpecs for their specification solution. We are also very fortunate to work closely with the HDR Specification Management team collaborating on features, processes, and integrations that improve their implementation as well as the value to all of our customers,” stated Seamus McGrady, COO of Chalkline. Visit www.chalklineinc.com or email [email protected] to learn more about the VisiSpecs applications, request a free trial, register for live webinars, see customer testimonials, and download product information. Chalkline is the developer of VisiSpecsTM, the next generation suite of applications to visually document, coordinate, and verify the BIM models and project specifications. The technology visionary award winning VisiSpecs is a hybrid cloud solution where it’s desktop and mobile applications store and access the model and specification data on the Company's cloud servers for easy access and collaboration among distributed team members. VisiSpecs is built on the familiar applications already in use resulting in minimal training and setup time. Users can easily integrate their own masters and project documents with the project models to accomplish true BIM integration without learning to use complicated model applications and without a lengthy integration process. And for those that do use the model applications, VisiSpecs provides direct, integrated access to the project specifications and documentation. For more information, visit www.chalklineinc.com. Portland, ME April 18, 2018 – BNIM, an interdisciplinary design firm that is an innovative leader in creating high performance environments, has selected VisiSpecs for specification writing, BIM model integration, and keynote coordination. BNIM decided to evaluate VisiSpecs to improve the specification writing processes and the ability to leverage integration with their BIM models and keynotes. Just three weeks into their trial of VisiSpecs, users and management gave VisiSpecs resounding approval. The trial showed the ease of upgrading their existing master specifications, timesavings creating new projects, and efficiencies gained through BIM model and keynote integration. Portland, ME January 16, 2018 – Chalkline, Inc. has been named the USA winner of BUILD magazine’s Visionary in Technology award. This inaugural award program was launched with a focus on companies who are shaping the future of the technology for construction and architecture sectors, and who continue to innovate and develop new techniques. This award was judged based on merit by the BUILD in-house research team with all potential winners assessed with multiple, relevant criteria, including previous accolades won; company performance over a specified period of time; influence within the industry, sector or region; and client testimonials or recommendations. The Visionaries in Technology Award was launched on the back of several smaller features BUILD has run over the past year. These features were well received by their readers, and they saw a rise in the demand for a focused award that both recognized technology firms and showcased their services to the BUILD readership. As part of winning the award, VisiSpecs is featured in BUILD magazine’s Q1 2018 issue. Keeping pace with a vast array of ever-changing sectors thanks to regular contributions from some of the world’s foremost construction, design and real estate experts and firms, BUILD is home to the very best news, features and comment from the people and institutions in the know. Taking in everything from the latest products and techniques, to up-to-the-minute design trends and industry-moulding regulations, BUILD should be the first port of call for any construction or property professional looking to remain on the cutting edge when it comes to theirs or related industries. Portland, ME October 23, 2017 – Chalkline continues development of the next generation of BIM integrated specs integrating specs, keynotes, and the BIM model. Currently these three disciplines are critical to the quality and coordination of construction documents, yet very separate processes. Inevitably, errors and omissions cause RFIs, Addendums, and Change Orders with resulting perception of lack of quality product produced. Design firms realize the benefits in time savings, coordination, and quality checks this integration enables. Many design firms simply do not attempt to use keynotes referencing specifications due to the level of work required to manually keep them coordinated. VisiRevit now enables users to manage master keynotes and automatically filter them based on the specifications in the project saving hours of tedious and error prone text editing. The VisiSpecs Link Console lists all the materials and elements contained in the BIM model with the linked specs. Now users can directly assign keynotes to those materials and elements with the visual model and linked specs all in view. VisiSpecs further makes this process more efficient including a search feature while assigning keynotes directly in the VisiSpecs Keynote Tree. VisiSpecs provides the most advanced Autodesk Revit Keynote Integration, Management, and Assignment solution. VisiSpecs also released synchronization of all user updates to keynotes ensuring the most recently updated list of keynotes is available. VisiSpecs Keynote Manager can be run directly in Autodesk Revit or in Microsoft Word depending on the user preference. Since the keynote file is saved in the VisiSpecs Cloud Server, users may easily save and access the keynotes in the application they already use. Customers also requested user roles and permissions be assigned to different users in the organization. Certain users will be managing the master or project keynote list while other users will be assigning those keynotes in Revit. Additionally, if multiple users are editing keynote files a check-out and check-in process alerts users if another user is editing the file. Visit www.chalklineinc.com or email [email protected] to learn more about the VisiSpecs Keynote Solutions and to request a free trial, register for live webinars, see customer testimonials, and download product information. Portland, ME August 07, 2017 – Chalkline, Inc. has added floating licensing to VisiSpecs, The Visual Specification System, while also simplifying the package editions. The existing strategy in pricing and licensing VisiSpecs to enable mid to large corporations the functionality and pricing options to best suit their budgets and implementation plans while also offering the smallest of firms a low entry price point continues. Larger firms require better user management and collaboration functionality with the ease of data access in the cloud and simple deployment across their offices around the globe. Smaller firms may initially only need easier and more efficient specification writing and publishing tools. Floating Licenses are now offered which help in the rapid deployment of applications across a firm while reducing the need to track individual user named licenses. A pool of licenses enables many more users within the corporate account the ability to install, register, and use VisiSpecs. Time and cost savings can be seen not only in the license procurement, but also in the management of additional licenses, users, and purchasing as VisiSpecs adoption increases throughout the firm. The Per User licensing will also continue to help smaller firms and teams implement VisiSpecs at a lower price point. Chalkline has also reduced the number of packaged Editions from 4 to 3 (Starter, Team, and Company Editions). This simplification assists clients in finding the right Edition for their needs with fewer Edition changes as their needs grow. Functionality within the Editions has been updated to reflect the major advancements in VisiSpecs over the past year. All VisiSpecs Editions now include the integrated Video Tutorials for FREE and Cloud Server storage space limitations have been removed across the board. VisiSpecs volume based license discounts start at just 11 licenses and the multiyear license discounts are still available. The time, effort, and cost savings benefits greatly from the VisiSpecs Hybrid Cloud Server deployment. VisiSpecs data is stored in Microsoft’s Azure Data Centers, which guarantees an industry leading 99.99% availability. All VisiSpecs databases are protected by redundant backups and replicated servers with automatic failover. To ensure availability for disaster recovery purposes, VisiSpecs data is also replicated on a continuous basis to a secondary Microsoft Azure Data Center located in a different geographic region. This Active Geo-Replication protects the data from a catastrophic failure within the primary data center due to natural disasters or other causes of prolonged downtime. With all these changes in functionality and pricing options, the initial price point remains at just $49/user/month while the Company Edition pricing is reduced to just $129/user/month. Floating licenses are an additional 50% and available immediately. The flexibility for month to month pay as you go payments and licensing will continue. Educational curriculum licenses are highly encouraged and continue to be freely accessible. 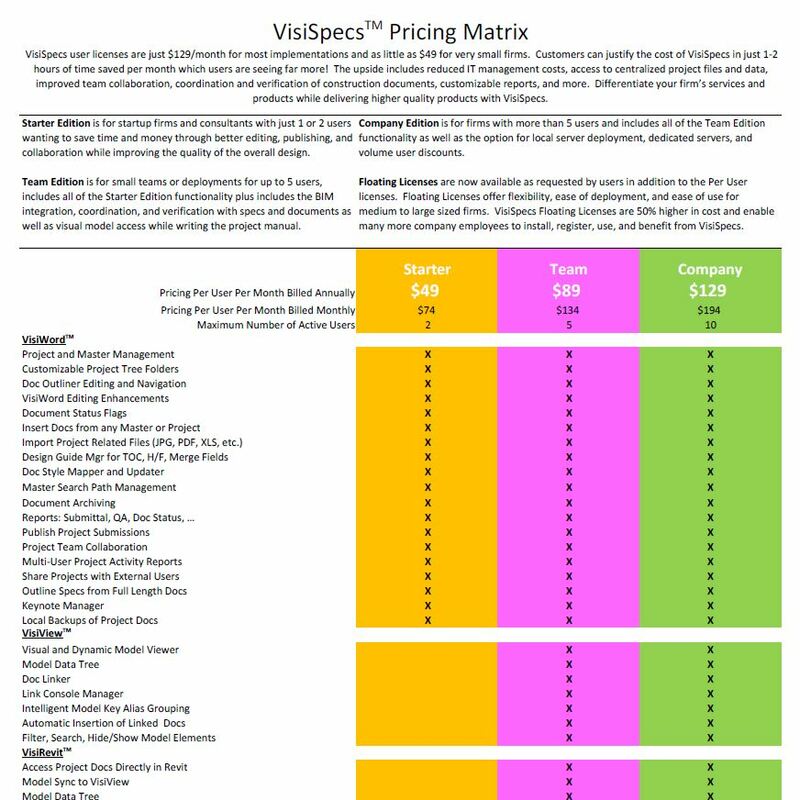 For more information on the VisiSpecs pricing, licensing, and more visit www.chalklineinc.com or email [email protected]. VisiSpecs customers share their experiences in Case Studies and Testimonials. "After editing just two sections I found VisiSpecs was not only very easy to learn and use but also saved us hours of time in the editing and publishing process." VisiSpecs is an easy right-out-of-the-box solution with minimal set-up and BIM integration time. One of the greater reasons for our selection of VisiSpecs as our BIM solution for connecting model information to our specifications, is the connection to materials considering our model materials library consists of over 1500 materials. VisiSpecs new publication, doc formatting, and more BIM integration and collaboration tools lead the new functionality list. Stellar needed an easy to use and deploy application as many users across the firm are involved in the design specifications. Architectural Nexus trialed VisiSpecs on a fast track project to determine how easy it was to use and the time savings was significant over their current spec applications. The first project had such great success they immediately decided to follow up on a second project. VisiSpecs v18.1 includes major new functionality such as BIM model integration directly in Microsoft Word, project and doc key filtering, PDF bookmarks, and more. Ease of use was critical for HDR as the transition needed to be seamless with a very fast learning curve. Just three weeks into BNIM’s trial of VisiSpecs, users and management gave VisiSpecs resounding approval. VisiSpecs provides the most advanced Keynote Integration, Management, and Assignment tools for Autodesk Revit. Users manage the keynotes directly in Revit or Microsoft Word with advanced synchronization and assignment. Chalkline adds VisiSpecs floating licensing and simplifies packaged pricing editions.